Coat the griddle (or thick-bottomed saucepan) with very little extra virgin olive oil then wipe off the excess with a kitchen paper towel. 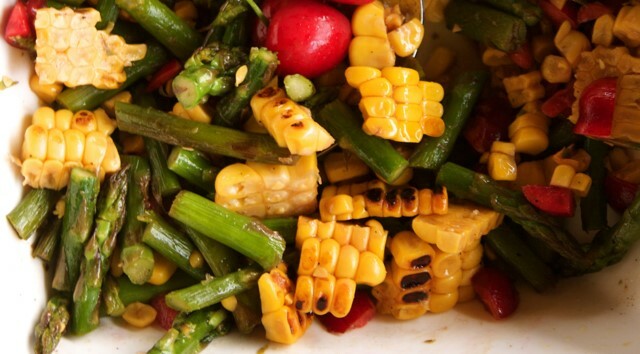 Over medium to high heat, grill the asparagus and the corn until they are cooked through and turn golden brown. Chop the asparagus coarsely then transfer them to a salad bowl. Hold the corn vertically then slice off the kernels in all sides with a knife. Transfer them to the salad bowl. Add the cherries in the salad bowl. In a small bowl, mix the balsamic vinegar, 3 tablespoons of extra virgin olive oil, salt and pepper. Adjust amounts if needed. Pour the dressing in the salad then mix well.